A Perfect Baked Potato will have a crisp skin with a light and fluffy inside. The steps to achieve these results are effortless! Most home cooks have been taught to cook a baked potato wrapped in foil, but this step is not necessary. If you enjoy baked potatoes from your favorite steakhouse restaurants, you will recall they have a crispy skin with a soft fluffy inside. 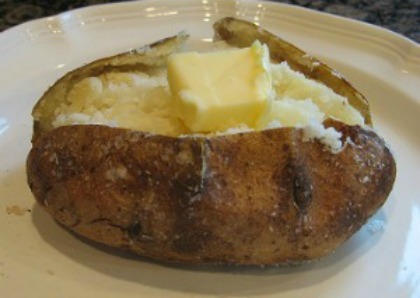 Baking a potato in the oven with no foil wrapping is the secret to baked potato perfection! So – throw out that aluminum foil! 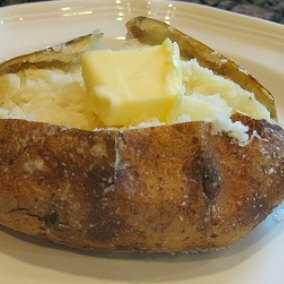 Rub the outside of the baked potato with olive oil or butter instead. If you follow our easy guidelines below, you will always have perfect baked potatoes! Which potato should I choose for baked potatoes? : Any potato can be baked, but for the perfect baked potato with the desired flaky texture, it is recommended that mature, baking-type potatoes such as the Russet potatoes be used. 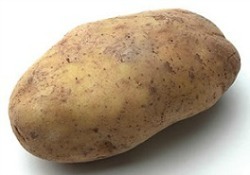 Russets are known as a starchy potato, a baking potato, or a mealy potato. The starch gives the potato it’s characteristic fluffiness. When you’re in the mood for a good, classic baked potato, it’s Russet Potatoes. Important: Make sure that the skin of your potatoes has a nice even brown tone without a greenish cast. Inspect the potatoes thoroughly to make sure that there are not any significant bruises, discolored spots, or sprouts. A sprout of any size can be toxic, but you would have to eat many sprouts to get sick. Do not buy potatoes if they have sprouted or have a green tint to the skin. The same is true for potatoes that turn a greenish hue. A potato in this condition is “light-struck” which causes a build-up of a chemical called Solanine. This is a natural reaction to the potato being exposed to too much light. The green part, if eaten in large quantity, can cause illness. When baking a lot of potatoes at one time, choose potatoes with uniform shapes and sizes; they will cook more evenly and get done at the same time. Check out Linda’s Potato Hints, Tips, and Information, and The History and Legends of Potatoes. Adjust the rack in your oven to the middle position and preheat oven to desired temperature (see Cooking Temperature Chart below). Rinse and scrub (I use a stiff-bristled brush) each potato under cold running water, as you will be eating the skins of these perfect potatoes. Do not soak the potatoes (that will make them soggy. Also do not use hot water or you will start cooking the outside and the inside will not catch up). Dry each potato thoroughly with a clean towel. Pierce each potato deeply with a fork or sharp knife four (4) times on each side at approximately 1-inch intervals (this will allow steam to escape during the baking). If you do not pierce the potatoes, they may explode during baking in your oven. You do not want this to happen as it makes a terrible mess in your oven! Wrapping the potato in aluminum foil will produce a soft skin (not crispy). Technically this is steaming rather than baking (as the moisture in the potato remains trapped) and the light, flaky texture will be missing. The texture of a steamed potato is entirely different from that of a perfect baked potato. Save yourself the trouble and expense of wrapping potatoes in aluminum foil and serve perfect baked potatoes. My suggestion is to NEVER use aluminum foil when baking potatoes! For a crispier potato skin: Rub the outside of the potato with olive oil, vegetable oil, or butter over the skins. I like to roll the potatoes in coarse or sea salt after rolling in the oil and before baking. Place coarse salt onto a small plate. Roll potatoes lightly in the salt. The skin is so yummy to eat when baked! Bake on racks of oven until tender. Bake according to the Temperature Chart below. Do not overcook potatoes as the insides will be dry, so it’s important to be vigilant. The higher the oven temperature, the shorter the cooking time will be and the crustier the skin. Larger potatoes will take longer to bake. Bake potatoes along with whatever else you are baking and gauge the cooking time according to oven temperature. Turn the potatoes over halfway through the baking time to prevent browning of the undersides where they touch the oven rack. Potatoes are done if tender when pierced with a fork to see if it slides out easily and you can check the internal temperature reaches 210 degrees F. Use a meat thermometer to test for doneness. You can also test for doneness by gently squeezing the middle of the potato (using a pot holder or oven mitt). If it gives in easily to your touch, it is done. 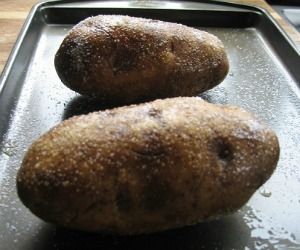 When baked to perfection, remove potatoes from the oven. Slit across the top with a sharp knife. Gently pinch (squeeze) in each end of the potato towards the middle (using your thumb and index finger). The potato will then pop open and loosen the fluffy white interior from the skin. Be careful as there will be some steam. 60 minutes at 400 degrees F.
80 minutes at 350 degrees F.
Place the potato directly on the oven rack in a preheated oven. Place a baking sheet (I put a piece of aluminum foil) on the lower rack (below the potatoes) to catch any drippings. 60 minutes at 375 degrees F.
80 minutes at 325 degrees F.
You now have a perfect baked potato – All you need to do is load it with your favorite toppings and enjoy! You could even make a meal out of your baked potato by topping with taco ingredients or additional meats and vegetables on top. Get creative! 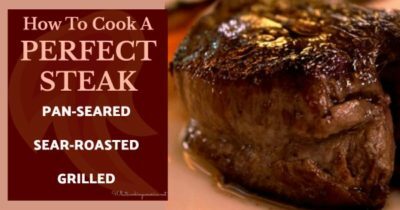 What goes well with the Perfect Baked Potato – the Perfect Steak! 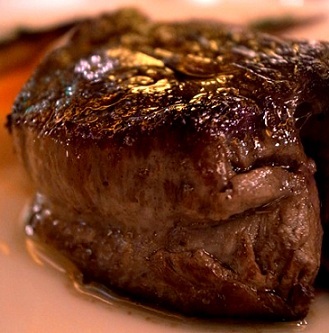 It’s hard to think of eating a juicy steak without a baked potato. These two foods go hand in hand. I’m 55 years old and tonight I cooked my very first baked potatoes. I don’t cook much. I didn’t cook my first chicken until I was 50, the list goes on. I don’t particularly like baked potatoes but my husband does. During our 15 year marriage, I did a bake potato for him once a few years ago in the microwave – it was edible. I think! Tonight I decided it make him real baked potatoes with his dinner and decided to look up how to do it. I found your website and followed your directions to the letter (except my husband doesn’t like a lot of salt so after baking with the olive oil and sea salt, I wiped off the sea salt before serving). He said he could still taste the salt and they were two of the best baked potato’s he has ever eaten. I didn’t have them but wanted them to be good for him and they were. From a hopeless cook and an American abroad, thank you so much for the Perfect Baked Potato. Cheers – Karen Harland, Middleton St. George, England. I have to bake apx. 30 potatoes at one time in a regular oven. How would you adjust the time/temp? Also am I safe to wrap them in foil after they’ve been fully cooked for serving purposes? If you leave room for each potato to not touch each other during baking, you should be able to bake all the potatoes at once without any time or temperature adjustment. If you wrap the potatoes in foil after baking, you will be steaming the already baked potatoes. Don’t do this unless you absolutely have to. You didn’t say how long you would need to hold the potatoes. If your time period is less than 1 hour, how about turning the oven off and leaving the potatoes in the oven until serving time. I baked 1 potato at 400 degrees F. Checked it at 45 minutes and it was not done so I kept cooking it for 10 more minutes, then 5 more minutes. Finally the potato was done in the middle! The skin was not crisp at all, just tough. I did not put oil on it before cooking because the information said that would give a soft skin. We wanted a crisp skin. This method did not give the results desired! My method is to rub olive oil and srpinkle salt on the skin before baking and you will get a nicely cooked potato skin and soft potato on the inside. By not rubbing with olive oil, you did not actually follow my recommended method. Also Remember – Great cooks use a cooking thermometer as their guide – not a clock. Cooking thermometers take the guesswork out of cooking, as they measure the internal temperatures of your cooked meat, poultry, seafood, baked goods, and/or casseroles, to assure that a safe temperature has been reached, harmful bacteria have been destroyed, and your food is cooked perfectly. Always follow internal cooking temperatures to be safe! 210 to 212 degrees F.
98 to 100 degrees C.
Please follow the recipe for perfect baked potatoes. I make these baked potatoes all the time. You will not be sorry! I have to cook lots of potatoes for a potato bar we are having tonight. My dilemma is that I need to attend a family baby shower prior to the time I need to leave for the event. How can I bake about 30 potatoes (l have double ovens) when leaving my house at 1:00 PM, returning about 4:30 PM, and then needing to leave for the event with my potatoes at 4:45PM. HELP!! Please ???? Amazing baked potato’s. I come back to your site every time I bake potato’s. Follow the instructions and you will have an amazing tater. My husband doesn’t like salt so i just don’t salt his and no complaints….. Love them. I live in Denver now and am wondering if I need to just time or temperature at altitude. I baked potatoes at 190 °C for 65 minuites and the potatoes were raw and uncooked. I put the potatoes inside the baking tray. What seems to be tge problem im male. You need to make sure to first pre-heat the oven and add the potatoes once the oven temperature reaches 350 degrees F.
Be creative with the fat! Bacon grease, lard, beef tallow are all very tasty used as coatings on these potatoes! What I loved the most about this website is its varieties. I have found many recipes that are fresh for me to cook. Thanks a lot. Amazing post! Thanks a lot for a great piece of advice. I like cooking, in particular potatoes, as well as my job (professional typing) so much. Actually, if I have a choice what to eat – a wonderfully cooked steak or potatoes – I will choose potatoes. I don’t know why, I just really like it and have tried a lot of ways to cook it. My favorite recipe is the simplest one: boil a few potatoes, at the same time I simmer vegetables in a pan (choose whatever you like: corn, green peas, carrots, broccoli, savoy cabbage). When vegetables and potatoes are almost ready, I just mix them in a frying pan, add paprika, black pepper, curry and Italian herbs, mix again and leave it for a few minutes. It’s delicious! Potatoes are done when the internal temperature reaches 210 degrees F. on your thermometer. I’ve also heard that restaurants bake them to 185 as they continue to cook for a bit once removed from the oven. Might try that, as they were *very* dry cooking to 210. Would foil help them not dry out? Family win’t eat skins no matter how amazing they are, so I might as well go for the perfect interior. You need to make sure to first pre-heat the oven and add the potatoes once the oven temperature reaches 350 degrees F. For large pototoes (about 8 ounces), I will usually bake for 90 minutes, then test with fork. If fork slides out easy the interior of the potatoes are done and the skin gets a nice wrinkle and crispness. This is the first time I have baked potatoes. Different kind and sizes were handled by fork tests. All from a friends garden. I am so greatful for the help. They taste great! I had to bake the potatoes (6) at 350 degrees for closer to an hour and 40 minutes to get them fully done and fluffy the way I wanted with crispy skins. Otherwise, a really good recipe!